I'm super excited! 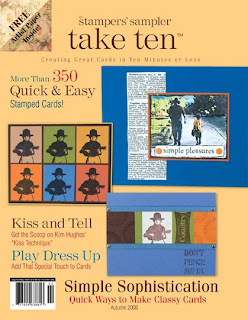 Stampingon has emailed the Post Script for it's Autumn '08 Take Ten, for readers to choose the cover. Two of my cards that I created with Artisitc Outpost's Singing Cowboy appear on the cover for option #1. It's been a goal of mine to have my cards featured on the cover of a magazine. Here's a peek at what the cover might look like if Option #1 is picked. Congrats! I thought those were your cards when I got my PostScript the other day! I hope your cover wins! Lisa, I didn't know it was yours, but I already voted for this one. I hope it wins.